I'm dedicating a whole post to this because it's such an important cause and Danielle needs your help. I first read about it from lilysquilts and thought what a great idea and surely it wouldn't take long to make. Danielle from DJ Cool Bear blog is organising a quilt to raffle to raise money for Movember and the Mary Potter Hospice in Wellington NZ. Danielle's lost her father earlier this year to prostate cancer and has put a call out to all quilters internationally to make a block to donate to the quilt. There will be two quilts made, one for UK and one for NZ. You can find the details on Danielle's blog - Can't Grow a Mo, Sew a Mo post. 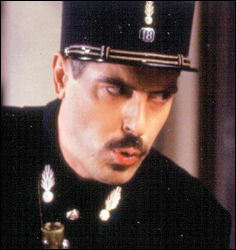 I decided on a fairly French looking Mo... It reminded me of the gendarme (policeman) Crabtree in 'Allo 'Allo.... and look at the lovely wine border, how appropriate, I love that fabric. So if you can spare an hour, please get busy making a Mo and help Danielle in her cause. Gorgeous 'tache Pippa - I shall try and make one today.